Silver coin of William and Mary. Pierced and bent, possibly for reuse as a love token. Reverse description: Crowns and shields forming a cross. 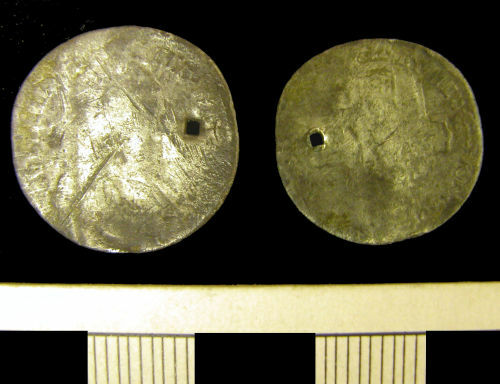 A silver groat of Mary (1553-4) bent and possibly re-used as a love token. Silver sixpence of William III. The coin is extremely but regularly worn, and it is bent twice; this coin has possibly been reused as a love token.